Spring is in the air and it’s that time of year when we get to really celebrate our parents through Mother’s and Father’s Day. But how often do we try and fail to really deliver on thoughtful gifts for our parents? I’m guilty of the “pile of paperback books for Mom” and “ blue tie for Dad” failings just like the rest of us, but this season will be different. This year I’m here to help by matching cutting-edge tech gifts with different types of parents, to make sure we really knock their socks off. From perfecting a twelve-point itinerary on the family beach trip to booking the best table for their anniversary date night, this gift idea goes out to our master planner parents. With the Google Pixel 2, you can help them out with the gift of a pocket personal assistant. A simple squeeze of the phone activates Google Assistant, where they can access their apps, request a ride via one of many rideshare apps, buy tickets to events, and more. The addition of Google Lens will help them quickly and visually get more info on things they see out in the world, from flowers to books and more. Plus, with long lasting battery life, a jaw-dropping portrait mode, heightened technical power, and one of the best in-device cameras on the market, they’ll have all the tools they need to continue mastering their schedules. From a family-legacy pasta sauce to a cutting-edge new fusion recipe they pulled from a haute cuisine magazine, no one cooks quite like your parents. Help them out in the kitchen (without having to actually help them in the kitchen) with a brand new Google Pixelbook. There are so many uses for the Pixelbook, the new adaptable Chromebook, but it’ll prove extra useful for the incredible, adventurous chef in your life. They can look up their favorite recipes, set it standing up on easy display in the kitchen, and even ask for help when they need to convert measurements. With Google Assistant integrated in the Pixelbook they’re the press of a button away from setting reminders to order more milk or buy more cheese. Then they can get right back to the kitchen and keep on cooking. Plus, it’s fully integrated with Google Pen, so they can scribble notes on their favorite recipes (my dad’s notes always seem to read: add way more garlic). Are your parents the type that are oddly hard to keep track of? One minute they’re putting together breakfast in the kitchen, the next they’re in the garage, and then you blink and find them in the attic. With the endlessly portable Google Home Mini, they can bring the usefulness of Google with them wherever they wander. 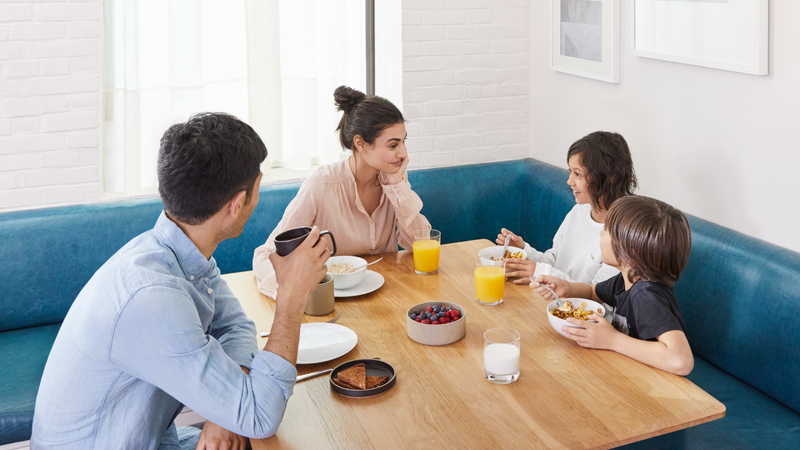 With Home Mini in the bedroom and the office, they’ll be able to easily set reminders, timers, get questions answered, play tunes, make calls, or use interconnected devices to broadcast information like an intercom. And the Home Mini is so small and discreet, it’ll fit in all over the home. Do you have a mom or dad who can’t stop snapping pics? Whether they bury you in old-school stacks of photo albums or keep a constant livestream of your life via their social feeds, the nonstop shutterbug parent loves capturing perfect moments. With Google Clips, your parents can shoot, save, and share motion photos all the time. For parents who always find themselves in the center of a whirling family party, the Google Clips can also be clipped or set up out of the way to capture all those amazing moments hands-free. Its flexible 130-degree viewfinder can even be manipulated through the app, as well as automatically, when on, so that your parents never have to sit out the family photo. And the more they use the Google Clips, the smarter it gets, recognizing everything from their adorable grandchildren to the family dog, so that they never miss the perfect moment. Do you have a parent who always finds their way to the pinball machine or old arcade cabinet at your local pizzeria? Or a parent who sends you non-stop requests for extra lives in their favorite mobile game? Get this kid-at-heart the gift of true gaming immersion with the Google Daydream View. It’s easy to use and accessible Virtual Reality that won’t require endless confusing patches, upgrades, and super-powered computer to run it. Simply slide a select smartphone (like the Pixel 2) into the view, and fling your parents into a world of imagination and adventure. I promise you won’t get calls at all hours asking for help setting it up, and they’ll never look at that frog-hopping arcade game the same way again. Some parents, no matter how busy, seem to always find time to stay completely up-to-date on every television show currently on air. I don’t know how they do it, but my parents know who’s winning on all the reality competition shows, who’s cheating on who in their favorite dramas, and which sitcom families are accidentally flooding their kitchens to hilarious effect. For these binge-watching, cliffhanger obsessed parents, a Chromecast Ultra serves up all their film, TV, and media needs in stunning 4K Ultra HD and HDR. Plus, with website mirroring and Google Photo integration, they’ll find more uses than ever for their home entertainment system. With these tech gifts from the Google Store, we’ll finally be able to make up for all the times we gifted our parents coupons for “five hugs” on Mother’s and Father’s Day. This post is a sponsored collaboration between Google Store and Studio@Gizmodo.